This interview took place in 2002 and was previously published in a shortened version in Sculpture magazine in May 2004, 23(4), pp. 22-3. The text with a white background is the shortened version; paragraphs with a gray background are from the original extended interview. Mark Pimlott. La Scala, (1999-2003). Reinforced concrete, 10 x 9 x 6.1 m. Installed at University of Wales, Penglais campus. Perched on a plaza overlooking the Irish Sea, Mark Pimlott’s La Scala (1999–2003) looks like a minimal stairway to heaven. But what is it—art or design? For the past 14 years, Pimlott has faced this question. Trained in both architecture and fine art at McGill, London’s Architectural Association, and Goldsmiths College, he’s been accused of lacking “commitment”; but fusions of sculpture, painting, photography, film, interior design, and furniture are the crux of his practice. Born in Montreal and resident in London, Mark Pimlott has exhibited around the world. In addition to La Scala, he installed Guinguette (2000) in Birmingham— both through Modus Operandi, a London-based public art agency. Pimlott also pursues an interior design practice. He was recently appointed to the post of Visiting Professor at the Technische Universiteit Delft in the Netherlands. R.J. Preece: Your work raises the question of whether it’s art or design. How do you see this? Mark Pimlott: I have come to see it simply as a practice where I look at a given situation, think about it analytically and critically, and make a proposal that I think is right. I want the work to be a part of the world—special, but part of the world nevertheless. Perhaps the pieces can be thought of more as art than design because of the way that they come into being and their relative autonomy. I am also quite protected from many of the conditions that are typically placed on a designer. And yet, I do many things that would be considered to be in the domain of the designer. I certainly work with the designer’s materials and methods. Although there are many public commissions, I think it has become rare for artists to work in ways that a designer might—to consider the same things. It used not to be the case. Artists in the past were asked to reflect on issues outside of their specialized areas of work. Like during the Renaissance and more recently with artists such as Noguchi or Chillida. R.J. Preece: You have mentioned that sometimes when you are presenting proposals in competitions, that the art/design issue comes up. What do you think about this? More often than not, the people commissioning a work are doing so because they want some sort of “solution” rather than some sort of “thing.” Ultimately, they respond to sensitive proposals that address their needs. This may put art in a difficult situation, because it is often expected to solve problems of all kinds. In Britain, for example, it is expected to provide solutions to local economic and social problems. I think this is an unfair expectation. It demeans and debilitates art. I do not even attempt to address these issues. My concern is with how people perceive themselves as active agents in the city and the world. R.J. Preece: How do you see La Scala, a public artwork on the Welsh coast, relating to Modernist architecture? Mark Pimlott: There are relations to the architecture of Le Corbusier, to his late work of the ’50s and ’60s—when he was making buildings and architectural episodes of emotional intensity and archaic beauty. For La Scala, I certainly had ancient Greece in mind. But also Gothic and Renaissance piazzas in Italy. R.J. Preece: What was the idea behind the piece? Mark Pimlott: The idea was to focus on what was already present, the concrete buildings designed in the late 1960s by Percy Thomas. The plaza of the university campus attempts to be a Renaissance piazza, with the buildings around it attempting to be civic buildings. There’s a chimney for the main boiler that is rather sculptural and known as “the campanile.” A hole in the plaza contains the stairway that goes down to the city. Mark Pimlott: My stairway sits like a piece of monumental furniture adjacent to the campanile. I used a stairway because of its frequent appearance in Italian piazzas, where it conveys utility and monumentality and invites a kind of civic theater. I wanted La Scala to do something similar. Just sitting down to chat with a friend, for example, you would be raised above the piazza and you would see the sea and the hills on the coast and the city below. The underside of the stair serves as a loggia for the nearby Student Union. I thought that this gesture would legitimate the whole ensemble and that people would be reconciled with the 1960s architecture. And I wanted to make a place where there was real beauty. Mark Pimlott. Guingette (detail), (2000). Installed at Birmingham Mailbox. Zenon-filled lamps, compact fluorescent lamps, acrylic/ polycarbonate globes, proprietary fittings, and cabling, overall site 54 x 34 x 4.4–6.2 meters. 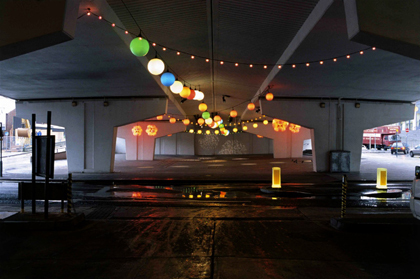 R.J. Preece: Your Birmingham installation appears radically different. How would you compare the relationship of each work to the viewer? Mark Pimlott: Well, they certainly look different, but they both came out of similar processes of thinking. In both, there was a reading of an existing place that wants to be something else. With Guinguette (2000), I imagined a story. And that story explains the form. At Aberystwyth, the story already existed. In Birmingham, an elevated motorway divided the city in two—inside and outside the road. The site was just outside the city and could therefore be free, yet it could still be part of the city. I made a lustgarten or guinguette, a festive place that would be there always, not just at Christmas. In both this place and Aberystwyth, people are invited to be in the work, to experience the pleasure of these places, to look at the world through them. In both cases, I want the viewer, or citizen, to feel free. R.J. Preece: Were there particularly influential people in the continued development of your education and practice? Mark Pimlott: Yes. At the Architectural Association, I was taught by Rodrigo Perez de Arce, who uniquely saw that my critical relationship to architecture needed space and encouragement. At Goldsmiths’, where I did my MA, I had the good fortune of being able to speak to artists and writers whose work I felt close to: Dan Graham (with whom I later collaborated on a project), Craigie Horsfield, Jean Fisher and Andrea Fisher were really important to me. I also have had the pleasure of writing about in some detail and meeting artists such as Michael Craig-Martin and Carl Andre, who also taught me a great deal. There are artists whose practices I have felt special closeness to, such as Tony Cragg and Michelangelo Pistoletto, and they have had a formative effect. And there are people I have been associated with, such as Andrew Brighton, Marysia Lewandowska, Brad Lochore and the architect Tony Fretton. Tony Fretton has been particularly supportive over a long period of time. We taught together at the Architectural Association, we looked at art and architecture together and talked. We still do. R.J. Preece: Was your practice always minimally oriented? Mark Pimlott: I was raised in the 1960s. I went to Expo 67 in Montreal and was exposed to the last architecture and possibly the last art of Modernism. It was still charged with hope. I saw my first Donald Judd and Carl Andre works then. Montréal was a showcase of modern architecture and infrastructure. The Métro, buildings by I M Pei and Ludwig Mies van der Rohe. I understood that work or at least felt it described the world I knew. I think a child can have a very acute picture of the world, an existential picture. So the language of Minimalism was familiar to me, natural to me. I understood that work, or at least I felt that it described the world I knew. Mark Pimlott. 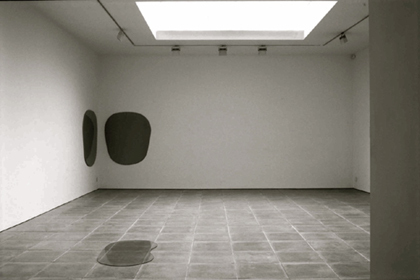 Pool (foreground) and Boue, (both 1996). Installed at Todd Gallery, London. Gloss-lacquered mdf, two parts: 1500 x 1100 x 12mm. each. My first work in architecture was more about language, influenced by Robert Venturi and Michael Graves. 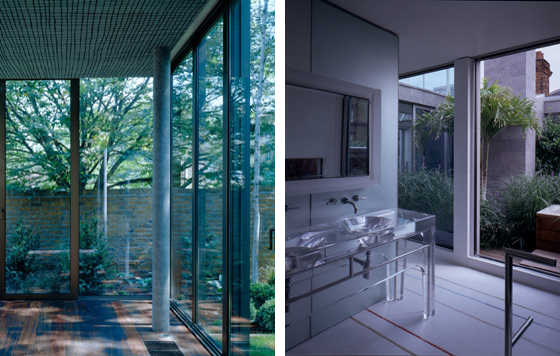 But before I studied architecture, I studied Mies and Le Corbusier. These apparently inconsistent influences are significant. The emotional and critical dimension in Venturi and Le Corbusier were allied in my thinking with the appearance and feeling of artists like Donald Judd and Carl Andre. Maybe this combination of emotion, politics, and asceticism can be found in Arte Povera, which I find particularly stimulating. I think this can be seen in my works such as Pool (1994) and Nothing (1998). I wanted the viewer to "be there", as one would be in relation to a Minimal work, but also to understand that the objects were contingent, that they were related to other things and ideas. Tony Fretton. 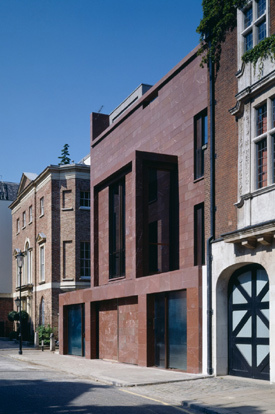 Red House on Tite Street, London (2001). (Studio Mark Pimlott, interiors.) Photo © Hélène Binet. R.J. Preece: How did the Sainsbury interior installations come about? The client knew me as an artist. Brad Lochore and I introduced him to the architect Tony Fretton. They worked together for a long time on the design of the house, and the client decided with Tony that there should be another voice involved in the design of the interior. The client wanted to move away from what he perceived to be the austerity of the architecture. A number of people were considered, and I was asked to submit a proposal. The client agreed and we started working together. R.J. Preece: Could you give some insights on how negotiations work in this kind of commissioning situation? How did it vary from public artwork and non site-specific sculptures exhibited in a commercial gallery? Mark Pimlott: I think the situation was quite unique. There was a three-way conversation between the architect, the client and myself at the beginning. I wrote a lot of descriptions of the house, using the architecture as a fictional framework for the interior. I tried to draw out the stories and ideas that were embedded in the architecture and the desires of the client. We settled upon a scope of work and then I developed designs for many parts of the house. These were incorporated into the architect’s work, and were built by builders and specialist sub-contractors. Left: View of the dining room into the garden. Painted ceiling by Mark Pimlott. Right: View of third floor bathroom into the courtyard. It differed from the making of a public art work in that there was a lot of negotiation between the three parties involved and in particular between myself and the client. Things changed very frequently, and my own work, which had been pretty austere itself, became more relaxed and fanciful, which became immensely important for the rest of my practice. The project allowed me to become free to propose things in forms I had not dared to before. I respond well to situations that are presented to me. The work finds a way to exist through a kind of negotiation. I do not tend to have ideas about autonomous pieces of work anymore. Even when I made work in gallery settings, the gallery was always seen as a real place, and the work was effectively designed for that place. R.J. Preece: For some people, this interview will introduce your work to them. Speeding fast forward, what issues are you currently dealing with in your art and professional practice? Mark Pimlott: I want people to be aware of themselves in the world. I want to use places as they are as agents for this realisation: that the world they are in holds the possiblity of freedom within it. This is not just an existential issue, it also has to do with how they imagine the world and themselves in it. For example, the fictions and fantasies about the city for constitute its reality. This is important for my work as an artist, but also for the interiors I design. R.J. Preece: In your design circles, do these people know you are also an ‘artist’? And vice versa? Mark Pimlott: They do know, on both sides. Though I think that the people who want me to design things are more intrigued about my practice as an artist, and the people who want me to make art can be more suspicious about my work as a designer. Commercial work can be seen to sully the fictitious purity of art practice. It is most problematic for other practicitioners: other artists, other designers. The “in-betweenness” continues to be problematic, even in these confused times. R.J. Preece: You’ve worked on hotel projects with Philippe Starck and lead designer Anda Andrei. How has this impacted on your art and design practice? Mark Pimlott: It has had a profound and rather unexpected effect. I have been able to understand the purpose of objects and interiors. Design is not about objects alone, but about how these objects fit into the world; how their image is constructed and disseminated; how they play a part in a larger project of making an image for an entire brand; how they serve an economy. Mark Pimlott: I have just been appointed Visiting Professor of architecture and interior design at TU Delft in Holland. I will be writing a book on the history of the interior in the twentieth century, talking about some of the things we have just talked about now, and also about cross-contamination in the design of objects and interiors. I have also just won a competition to make a major work, a place, at the BBC’s headquarters in Portland Place in central London. It is called and it is a portion of a sphere that emerges through the street. People walking across it will feel as if they are on top of the world. And there are other things bubbling away. I am trying to make some more films. R.J. Preece: And what are your future dreams? Mark Pimlott: To make beautiful places and a place to live in a beautiful place. * This answer and the previous question were included in the shortened version, but the more detailed discussion is included above.